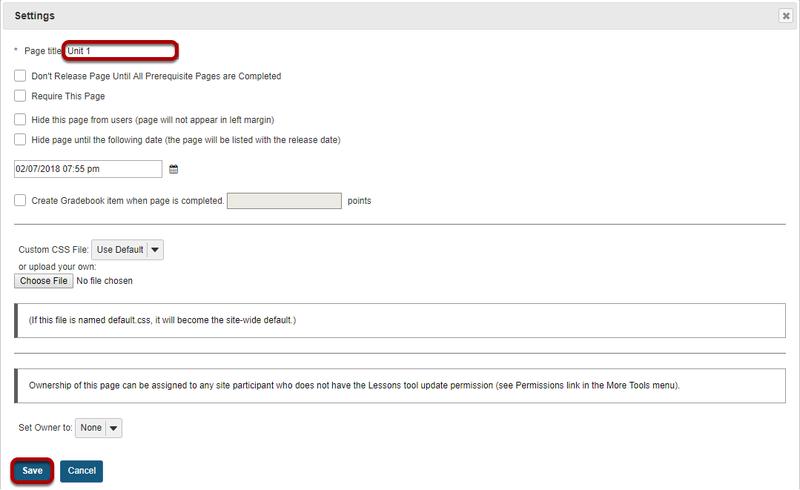 Sakai Community DocumentationSakai 19 User Guide (English) LessonsHow do I create a new Lessons page? Zoom: Enter a Lessons title and click Continue. To retitle the Lessons Page, click on the Settings icon (i.e. gear icon). Zoom: Enter a new title. Enter a title and Save. Zoom: Enter a title and save. Notice that you also have the option to add several pages at once by indicating the Number of pages desired below the title. The number of each new page will replace the number in the title provided. You also have the option to Make new pages copies of the current page by checking the box provided. Prev: What is the Lessons tool? Next: How do I add text to a Lessons page?